Powers/Abilities: Blake erratically develops superhuman strength (Class 25?) and steel hard skin, and he glows bright white. He could shrug off double .40 rounds, but .44 magnums at close range could bring him down. He also suffered from a pathological hatred of African-Americans and when his powers surfaced he degenerated into madness such that he could only speak in growls. 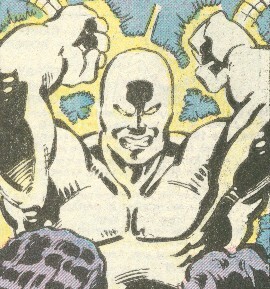 (Power Man and Iron Fist#123 (fb) - BTS) - William Blake grew up in the deep South, where he was brought up to believe blacks (African-Americans) to be inferior to whites (Caucasians), causing him to develop a pathological disorder. (Power Man and Iron Fist#123 (fb) - BTS) - Blake joined the Marines, eventually volunteering for an experiment designed to recreate the Super-Soldier serum that created Captain America. (Power Man and Iron Fist#123 (fb) - BTS) - Blake's upbringing caused him conflicts with the black guys in his company. He shared information on his upbringing with his company shrink. (Power Man and Iron Fist#123 (fb) - BTS) - Following his discharge, Blake was unable to hold a job and was picked up on various small change crimes. 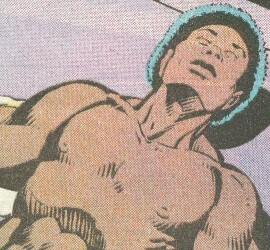 (Power Man and Iron Fist#123) - Blake was taken in as a boarder by a black mother of two kids in an apartment on second floor apartment on Ninth Avenue and Forty-Nine Street. One night Blake freaked out, yelling racial slurs at the mom and kids, after which he started glowing, killed the mom and kids with his bare hands, and crashed through the wall. Police officers tried to no avail to bring Blake down, after which he attacked the police, killing three black officers while screaming racial slurs. Det. Tyrone King was called in to bring in Blake, as reports of the white mutant killing blacks began to provoke race riots. When Blake attacked a pair of college students outside of Sam Wilson's social worker office, he was assaulted by the Falcon and King, while Cage was on hand to catch a car Glowworm threw. King fired a series of .44 magnums into Blake's chest, knocking him out, and he was taken custody by the police. However, due to an administrative oversight, local officers were forced to turn Blake's still glowing form over to the Marine's military police. As racial tensions rose, including accusations of a military cover-up, Cage bowed to public pressure (and criticism of his loyalty to the black community) and joined with the Falcon in assisting King in taking Blake from the Marines by force. Cage broke Blake out of the transport vehicle and then fought him, desperate to prove himself to the people. Blake finally fell before Cage's attack, returning to normal and revealed to actually be a black man. Blake's being listed as white turned out to be a computer glitch, resulting in a rapid dissolution of the protest groups and Blake being re-labeled as a victim of society and misunderstood young soldier. Blake was taken to the Wards Island Psychiatrist center under the care of Marine scientists. 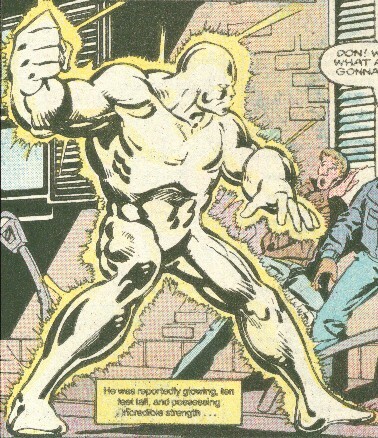 (New Avengers Most Wanted Files - BTS) - Glowworm was reported as having remained in prison since his initial capture. Comments: Created by Jim Owsley (now Christopher Priest), Mark Bright, and Jerry Acerno. To the best of my knowledge, nothing further was explained with regards to the Super-Soldier process used on Blake, but it would seem closest to the one used on Cage, indicating it may have been derived from Noah Burstein. Please don't be offended by the use of the term black or African-American. Black was the term used in the story by Owsley/Priest, who is African-American.